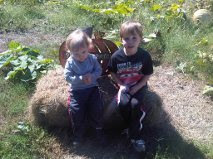 My mom took the boys and me to a corn maze this weekend. It was really cool and the boys had a good time. Bob had a previous engagement, and couldn't go. Mazes are much more his area of expertise. He asked how we did, and I told him that my decision to let the 2-year-old lead us through the maze might not have been the best, but we still found about half the clues. Neither boy wanted to pose with the pumpkin. 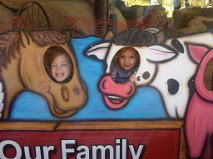 But they did a good job with the farm faces. After a busy morning trekking through the corn maze, we went to a Red Robin and the boys had a good time "playing" in the arcade. 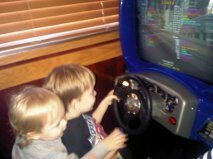 I love how at this age they are content to steer the wheel without me putting any money in the machine. We had a great time Gram, thanks! Fun! 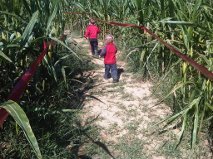 We did a corn maze this weekend, too. Lots of good exercise! Wow! Your corn looks so nice and green and lush. I think ours was nearing the end of its life.